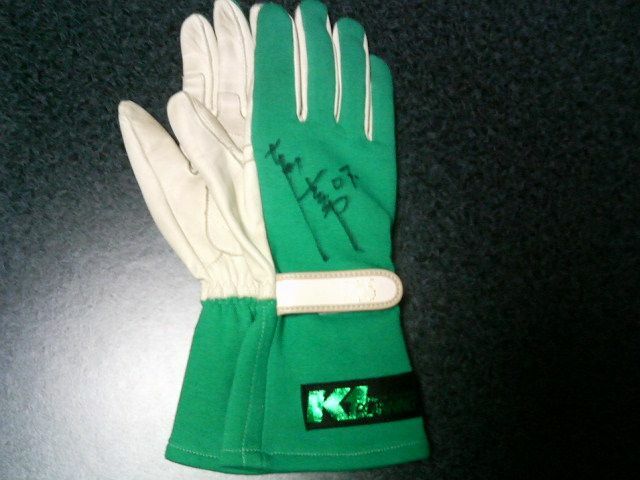 As the title implies, does anyone have a green pair of Keiichi Tsuchiya's racing gloves (K1 Planning or Kei-Office). Would prefer in near-new condition but I won't mind if used. You may comment and/or PM me if you're willing to let go of your pair. I'm not sure if anyone here does; if so, they haven't often mentioned it. I haven't done any digging, but are they something that was produced for sale or are they your typical fare with sponsored drivers, where they are all one-off gloves and the only market availability are used ones? They were produced for sale I believe from 1995 until 2013 (Kei-Office died in 2005, KT made DG5 and produced the gloves under his personal company, K1 Planning). Many drifters (D1 and very few privateers at least) used them. And yeah, they come pre-owned 98% of the time nowadays unless you're lucky . My friend of mine in the UK had a orange pair in new condition that he got off YAJ 2-3 months ago. My friend of mine in the UK had a orange pair in new condition that he got off YAJ 2-3 months ago. Alex (Takumi Trueno) or J'Kaiba can probably help you out better given he's in Japan at the moment & J' goes quite often ~ send 'em a message! I'm your man. If you can pinpoint me exactly where to buy them, I can get them next month. Pretty sure you're screwed. I tried the usual places and couldn't find anything. It looks like your last real chance to nab a pair was 2005 or so, and nowadays you're gonna need a miracle if you want to find someone selling one. Best of luck to you. I've no actual clue where they physically are? XD The 1st four are great for parts clothing & goods. The latter two are tuning shops so ~ just for window shopping & taking cool selfies inside vintage Lambos haha! J' ~ where u at help ya nuggaz out!! It almost might be easier to have a set made one-off. And then at least you've got a cool story behind them as well. Anyone who knows me knows I'm a sucker for anything limited production/one-off, I just love having stories to things. Having recently come into a pair of one-off racing gloves (Sabelt, red, Brembo branded), they can be a pretty cool conversation piece. Yeah..I guess so. I'll be honest, I actually own a orange and blue pairs of these Kei-Office gloves with first pair being black (I gave them away to a good friend in Portugal) but of course green is the more unique-looking set that everyone wants. I actually do use the (Orange ones atm, already wearing out) rather than being a collector. On the side note, I got a pair of rare 1990s Advan Suede Shoes that KT, NOB, and Koguchi wore in their early days and getting the red Varsity Jacket that every Advan head wants even though I'm a Bridgestone guy ). They're awesome to wear but the weather has been hectic in Canada lately.